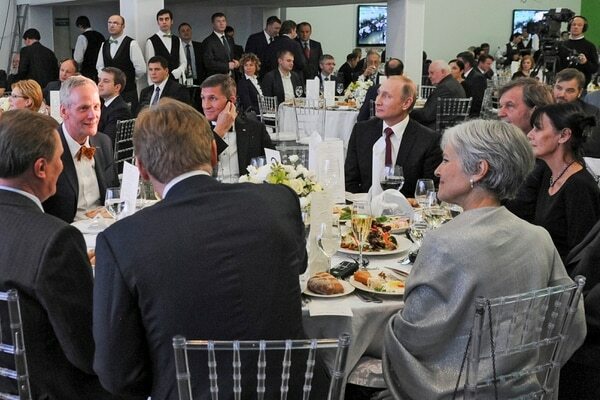 Over the weekend, Russia-gate took an even more surreal turn when former Green Party presidential candidate Jill Stein was accused of being a Russian-stooge because she shared a table with Vladimir Putin and former General Michael Flynn in 2015 at an RT dinner celebrating their 10th anniversary. Here’s one of the tweets to demonstrate just how far down the rabbit-hole the Russia-gaters have gone. Here is the photo of the infamous dinner where Flynn began to coordinate on behalf of trump with Putin in Russia and was paid to be there. Question – why is Jill Stein here? She has never given a reasonable answer. She was paid to run as part of their conspiracy. And another from someone in the “Resistance”, (who’s obviously off her meds). #NetNeutality Go away Dr. Jill Stein. Traitor?! You sat at PUTIN’s table w Mike Flynn. Were you part of Putin’s attack against our 2016 election? Later you took $ from kids in fake recount promises. Return $ to them! #TheResistance#Midterms2018, Beware of Jill – friend of Putin. Yesterday, Russia-gate got local, when the Salt Lake Tribune ran a story entitled–Ex-SLC mayor found a seat at Russian dinner. Rocky Anderson, our radical ex-mayor who famously protested President George W. Bush when he came to SLC, was at the 10th anniversary RT gala as well. While not at the same table as Putin, he was in the company of “noted communist” Peter Kusnik, who with director Oliver Stone made the controversial documentary–The Untold History of the US, (probably at Putin’s express direction). If all this sounds like an episode of South Park, you’re not alone. History professor Jackson Lears recaps the sheer idiocy of Russia-gate in the London Review of Books—What We Don’t Talk about when We Talk about Russian Hacking. “A story that had circulated during the campaign without much effect resurfaced: it involved the charge that Russian operatives had hacked into the servers of the Democratic National Committee, revealing embarrassing emails that damaged Clinton’s chances. With stunning speed, a new centrist-liberal orthodoxy came into being, enveloping the major media and the bipartisan Washington establishment. This secular religion has attracted hordes of converts in the first year of the Trump presidency. In its capacity to exclude dissent, it is like no other formation of mass opinion in my adult life, though it recalls a few dim childhood memories of anti-communist hysteria during the early 1950s. Frustrated Democrats hoping to elevate their election fortunes have a resounding message for party leaders: Stop talking so much about Russia. … Rank-and-file Democrats say the Russia-Trump narrative is simply a non-issue with district voters, who are much more worried about bread-and-butter economic concerns like jobs, wages and the cost of education and healthcare. Russia-gate is also about the corporate media freaking out about their loss of credibility and respect. If you look around you’ll notice that there are a myriad of corporate media stories that have one thing in common–they all paint anti-establishment speakers, writers, film-makers and even comedians as “Russian propagandists” simply because they advance opinions that run counter to US establishment interests. George Orwell would surely appreciate this moment or two. This entry was posted in neoconservatives, neofeudalism, neoliberals and tagged 1984, Alice in Wonderland, Caitlin Johnstone, drinking the Kool-Aid, echo chamber, General Michael Flynn, George Orwell, guilt by association, Jackson Lears, Jill Stein, Kremlin collusion, Lewis Carroll, London Review of Books, McCarthyism, resistance, Rocky Anderson, Russia, Russia-gate, SLC Tribune, South Park, Vladimir Putin, What We Don't Talk about when We Talk about Russian Hacking., witch-hunt. Bookmark the permalink.